The City of Waterloo is going to investigate the possibility of using Internet and telephone voting in time for the 2014 municipal election. There is already some concern about e-voting. Waterloo Regional Councillor Jane Mitchell writes My problem with on-line voting is the end of the secret ballot. One of the principles of our electoral systems is anonymity. Another principle is “One person, one ballot”, or singular voting. Both objectives are reasonably easy to do with paper ballots – hand out one ballot to a voter, then cross that voter’s name off the list. The vote cast is both anonymous and singular. But when people are allowed to vote anonymously on their home computer there’s no way to determine if they’re voting more than once. So to prevent multiple votes you’d have to track voters with a unique ID; but that can then be correlated with the vote cast, destroying anonymity. Fundamentally, anonymous and singular voting is not achievable through computerized at-home voting. In a report “Technology and the Voting Process”  the conclusion of Elections Canada was that the integrity of electoral process is a cornerstone of our democracy, and a decision to move to electronic voting should not be made lightly, without much more study. “Much more study” has not been done by our municipal government. 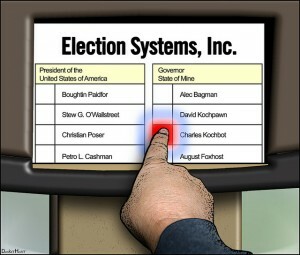 Voting Screen by DonkeyHotey is used under a Creative Commons — Attribution 2.0 Generic — CC BY 2.0 license. This entry was posted on Monday, January 28th, 2013 at 6:10 pm	and is filed under E-Voting, Election. You can follow any responses to this entry through the RSS 2.0 feed. Both comments and pings are currently closed.